«Write what you know» is a classic advice given to aspiring fiction writers. It’s a guideline suggesting that the eventual typed-out product has a better chance of obtaining quality if it comes from a self-experienced point of reference—the writer actually knows what they're talking about. They’ve felt it, seen it, heard it. Bedclothes company Abate’s story is an entrepreneurial version of the same approach. The company—founded by two pilots who in their line of work spend countless nights, in countless hotels, in countless different countries—know from experience the importance of a good night’s sleep, and thus the value of quality bedclothes. And so cotton was woven. Hi guys, tell us about yourself. We’re Kristian Hesselberg and Leo Andersson, two airline pilots who want to challenge the established bedlinen companies in Scandinavia. As airline pilots we understand the importance of good quality sleep. We are expected to be well rested when changing time zones, commuting and being up early mornings and late nights. From our experience it seems apparent that better quality bed linens improves ones rest, and we were surprised to see that most bed linens being sold in Scandinavia had a very basic quality. 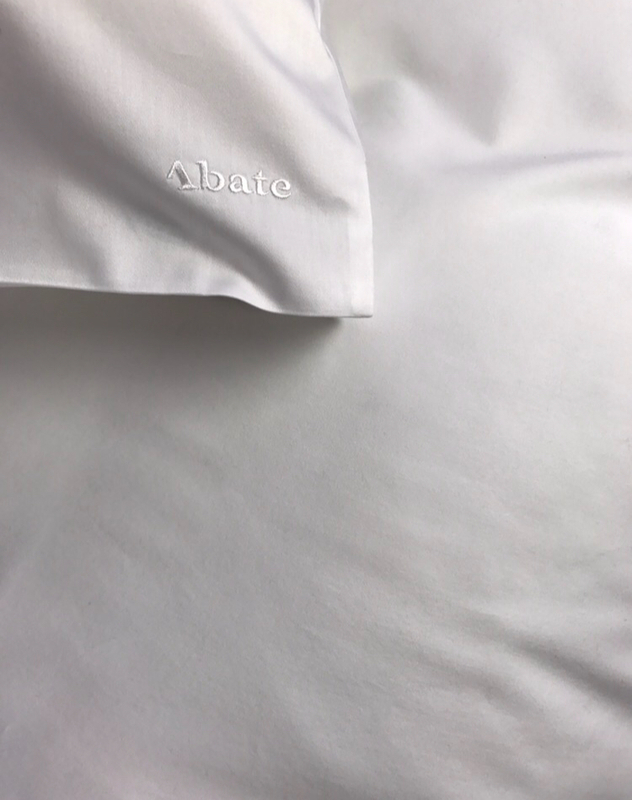 So we decided to start Abate and make high quality bedding basics more accessible. What is a good set of bedclothes? First you look for the best cotton quality. It has to be at least what's called a “long staple” cotton. These are found several places in the world, but as a small startup our view is to differentiate on quality and use only what we see as the best, so we use special long staple Giza-cotton from Egypt. Then the weaving and sowing must match the quality of the fabric itself. With this you end up with the thinnest, finest possible sheets to give that cool and soft feeling which only high quality cotton can offer. Our bedlinens stay beautiful much longer than conventional cotton sheets, so you won’t have to change as often, and our style is minimal to act as a bedding basic you want to keep over time. Tell us about your name, Abate. Abate means to reduce, which mirrors our vision of being a transparent and open company. As consumers we found it difficult to understand the difference between different qualities when it comes to bedclothes—It’s hard to find information on that subject. We want to inform our customers of what they should look for when buying bedclothes. In addition we’re open about our production and where our materials come from, which are all choices based upon sustainability. We don't want sell by persuading, we want to sell by playing with open cards. BIG’s Inflatable Pavillion just returned, but this time as beautiful household object for MOSSS. What if all our ideas could live forever, and what exactly can we learn from approaching the same concept through a different discipline? …our muse. As soon as we made it there was no end, there is no beginning. The circle is not a journey to get to some place, it is a process which is in pursuit of a process itself. It is the ultimate creative quest. Togetherness and community are in focus during this year's Norwegian Presence exhibition at Salone del Mobile—a comprehensive insight into the collaborative nature of the Norwegian design industry. Using the ground breaking material concrete canvas, industrial designer Neal Aronowitz's furniture expresses a light, fluid and lyrical form, in contrast to the dense and heavy associations we have with concrete. A reflective, minimalistic, Scandi-inspired delight of a bar collection. Two pilots and a heap of quality cotton. Designers Saturday: Three days, 190 exhibitors, 36 locations. Norway's biggest design fair is about to kick off. A chance to get your hands on Norwegian one-offs.